NOTE: The stainless retro grill will sit about 1/4" higher than the stock OEM grille to emulate the styling to the vintage roadsters of the past. You will adjust your hood bumper stops to compensate for this. In addition your stainless grille will need to be hand formed (bent slightly) to match your Prowlers front end. Read all the directions before starting. 1. Remove the factory grille by opening the hood and unscrewing the three screws securing the three factory grill to the body. 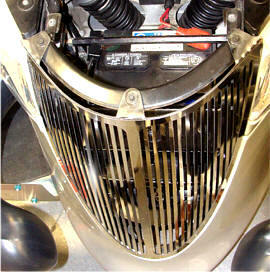 Remove the two additional screws securing the sides of the grill to the inner frame of the body. 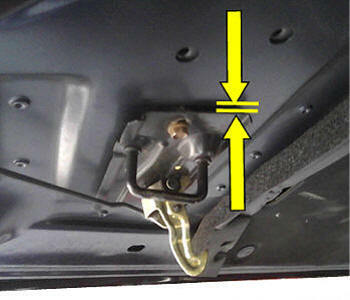 Pull the grill towards the back of the vehicle to detach the lower grill chin pin from the body. See Diagram 1 below. 2. Your new grille insert will install in much the same way as the factory grill was removed but without the two center metal attachment arms and screws. They won't be necessary. 3. Before you begin to install your new grille we recommend that you treat the newly exposed area behind the factory grill for the best looking end result. You can do this by thoroughly cleaning the exposed areas as well painting the aluminum frame and any light colored items black. We have provided you with a strip of mat black adhesive vinyl to be applied to the inner rim of the newly exposed fenders. To apply this vinyl simply scrub clean this rim and then carefully peel the release liner from the back of the vinyl and apply it directly to the rim about 1/4” in from the outer edge. This will blacken the inner edge of each fender which would otherwise be seen through the new grille. 4. Now that you have prepared your opening you can now set the new grill in place. 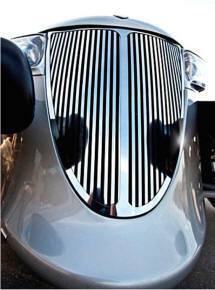 Before you begin take a minute to make sure your new grille has a nice curve to it. Although your grill comes to you pre-shaped it will almost always be necessary to shape the grill further by hand in order to achieve a nice contoured fit. Force the chin pin at the bottom of the new grille into the notch at the base of the opening. Make sure that this is thoroughly and firmly seated. This is important because you do not want to have excessive pressure on the grill once you close your hood. In fact since all Prowler vehicles where handmade each of them may have a slight variation from the bottom of the opening to the underside of the hood. To overcome this it may be necessary to adjust the hood stops up or down to achieve the perfect arrangement. With the chin pin correctly inserted set the top of the grill over the three exposed screw locations at the top of the grille. It is also important to make sure your grille is set correctly at this point. This may take a couple of adjustments so that the grill tucks nicely under the hood. We have designed the new grill to look like it is attached to the hood when closed just like they were in the old days. However, you do not want the grille to damage the paint on the underside of the hood so we have provided five ¾ fuzzy Velcro pads to be placed under the hood at the two corners where the grill may meet the hood at the dead center and in between those two points. This will prevent any possible damage to the paint long term. 1. Make sure the Grille is completely seated at the bottom. As low as it can go. 2. If you push the Grille back towards the engine when mounting it will allow extra space for the hood to close (See diagram 1). 3. Twist the hood stops counter clockwise to raise them up. This will give you more clearance so the grille will fit (See diagram 3). For that 1 in a 100 Prowler. Because Prowlers are all hand fitted they do vary per car. Sometimes there is a Prowler that is a little more off than the usual variance. If you are still having a problem closing your hood because the grille is too high you can also use this tip. 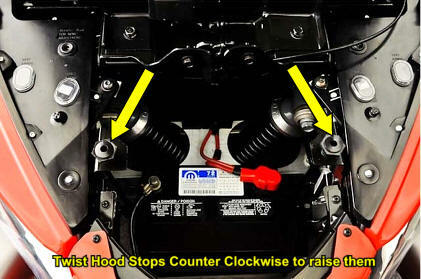 Put a spacer (like a washer or two) under your hood latch. Remove the latch base and insert one or two washers and then reattach.